The chapters of William Durand’ Rational (13th century) are most expressive of the medieval conception of the Mass. What follows are some of his interpretations of the first part of the Divine Sacrifice. The grave and moving chant of the Introit opens the ceremony. It expresses the expectation of the Patriarchs and Prophets. The choir of clerics represents the ensemble of the Saints of the Old Testament who long for the coming of the Messiah Whom they await but will not see. Then, the Bishop enters. He is a symbol of the living figure of Our Lord Jesus Christ. His arrival represents the coming of the Savior, the One awaited by all Nations. At great feasts seven torches are carried in front of the Bishop in the procession to remind the people that, according to the words of the Prophet, the seven gifts of the Holy Ghost hover above the head of the Son of God. The Bishop advances under a triumphal canopy carried by four persons, who are compared to the four Evangelists. An acolyte walks on either side of the Bishop representing Moses and Elias, who appeared on Mount Tabor on either side of Our Lord. They teach us that Jesus Christ was supported by the authority of the Law and the Prophets. The Bishop is seated on his throne and remains silent. He seems to play no role in the ceremony. His attitude, however, has a lesson for us: this silence reminds us that the first years of the life of Our Lord were lived in obscurity and recollection. 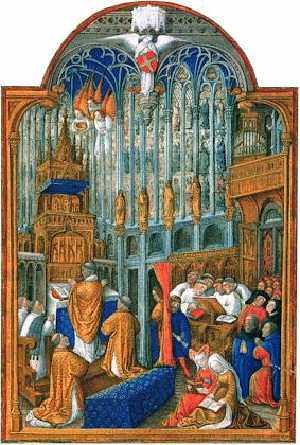 The Subdeacon, however, walks toward the Bishop's cathedra and, turning to the right, reads the Epistle in loud voice. With this first act the drama of Redemption starts. The reading of the Epistle represents the preaching of St. John the Baptist in the desert. He speaks before the Savior’s voice is heard. But he speaks only to the Jews. The Subdeacon, the figure of the Precursor, also turns toward the north, which represents the Old Law. When he finishes, he bows before the Bishop just as the Precursor humbled himself before Our Lord. The chant of the Gradual that follow the reading of the Epistle is yet another symbol of the mission of St. John the Baptist: It represents the exhortation to penance he made to the Jews to prepare for the new times. Finally, the Celebrant reads the Gospel. It is a solemn moment because here the public life of the Messiah begins. His word is heard for the first time in the world. The reading of the Gospel stands for His preaching. The Creed follows the Gospel as the Faith follows the announcement of the Truth. The twelve articles of the Creed are linked to the vocations of the Twelve Apostles. When the Creed ends, the Bishop stands up and speaks to the people. By choosing this moment to instruct the faithful, the Church wants to remind them of the miracle of her growth. She shows them how the Truth, received by only the Twelve Apostles, quickly spread over the whole world. This is the mystic symbolism that William of Durand attributes to the first part of the Mass. After this preamble, he goes on to describe how the Passion and the Sacrifice of the Cross are seen in the Mass. But here, his commentaries are so abundant and his symbolism so rich that a summary does not suffice to present it. It is necessary to go to the original.